This picture is kind of a cop-out, because it’s not exactly difficult to get. Sort of. 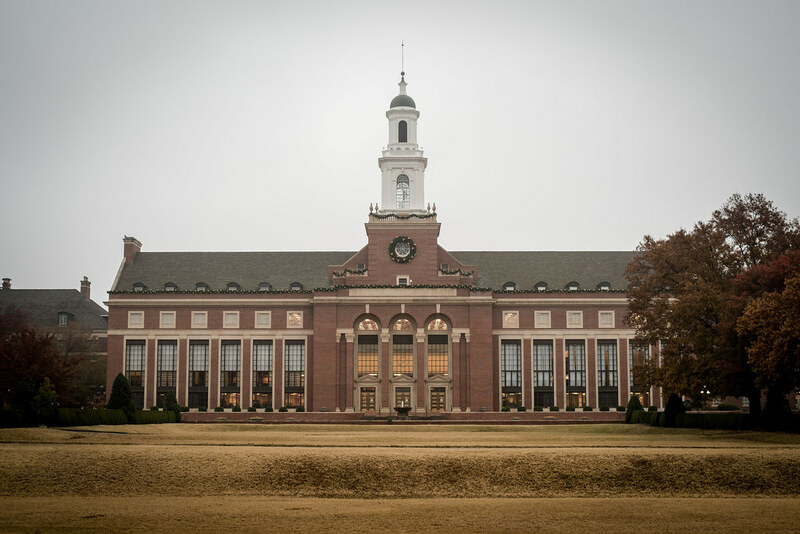 I mean, it’s the Low Library on the OSU campus and anyone can walk by and snap a photo of it any time they want, so why bother using as this week’s photo here on Weekly Fifty? Because even though this is, by most accounts, a relatively common and simple picture there were some thing that made it unique such that I felt like it deserved a spot here on the blog. I shot this on a foggy morning right before work when I had my camera with me and noticed the particular way in which the library and its well-lit interior stood in stark contrast to the dull gray sky and otherwise rather bland surroundings. I’d guess that in any given year we have maybe five to ten morning that are just thick with low-lying clouds, and often the light just doesn’t quite work out to get any type of interesting image before sunrise, so to get the library looking like this actually is somewhat different from the norm. Also there are no students present in the foreground, or really any people in the picture at all, which as anyone who has ever been to OSU will tell you is not all that common. Finally the uniform dull orange of the grass in the foreground, coupled with the gray overcast sky, gave the entire composition a feeling of cool melancholy that I found to be strangely compelling. The editing was also a bit different for me, since I normally like a little more color and saturation in my images. Here I actually reduced the overall saturation just a bit and added a twinge more vignette than I usually do, because it really felt like it suited the mood of the photo. And maybe that’s the big takeaway for me here: this picture isn’t about creating art or a visually pleasing image per se, but more about capturing a mood. I’m not sure how well I actually succeeded, but if nothing else I hope it helps you the viewer think of an early morning with a bit of a slow pace–a hush or a held breath before the start of a busy day. What a great shot of the library! I have to tell you that, as an OSU alum living in Florida, I love it when your blog features pictures taken on campus. Thanks for sharing your journey with the rest of us. Very well stated Simon. I like not only your photography but the prose and the thought process with each and every photograph. Do you teach English language or poetry :-)? One can create good images each and every day looking carefully for the opportunities present in the immediate surroundings. Thank you for such a nice comment! I used to be a high school English teacher but I’m afraid I often let my writing slip here on the blog. I’m glad you like it though! I really should take more time to proofread! A photo that could be messy has been distilled into a steeple breaking away from a series of horizontal lines. I like it a bunch. Bill, I didn’t even think about the steeple breaking through the horizontal lines in the picture. You’ve got a good eye! I’m going to try to remember more compositional elements like that in the future. You know Dennis, as I look at the photo I guess it does sort of hearken back to an earlier time. I didn’t edit to be like that, but it’s just something that happened with the fog and the early morning light. I’m glad you mentioned that, and it makes me think about the profound effect these sorts of things have on the pictures we take! Just showing up at a different time of day can have a big impact on the composition and even the meaning and interpretation of the picture. I agree with Dennis, this photo is timeless.